Beneath its superb gelcoat finish is a structural rigidity that can take the punishment that this sort of boat is likely to receive. The attention to detail is reassuring, as is the consideration given to potential future retrospective maintenance. Not many RIBs this size offer such a blend of practicality and performance at this price while including key items that many yards put on the extras list. It would be fair to say that the RIB is a thoroughly British concept. We invented it, we developed it and in various forms we have built legions of them. A quick glance around the Solent and the West Country will leave you in no doubt about their enduring popularity. It seems no adventure is complete without one as few boats offer such seaworthiness, performance and versatility for the money. However, with quite a few iconic British brands no longer trading and the increasing trend to outsource production overseas, it seems that the label of ‘built in Britain’ has become an expensive luxury. In contrast, Island RIBs, based in East Cowes on the Isle of Wight, make no claims to reinventing the wheel, but they have a dynamic approach to high-quality low-volume production, all of which takes place in their Isle-based yard. Headed up by ex-engineer Alex Cottle and Brian Hallett, with 20 years in the RIB industry, this small company, established in 2014, builds a range of high-quality RIBs from 7m to 10m whose prices shame some of their competitors. They only subcontract to Henshaws to fit the 1300gm five-section Hypalon tubes that their boats come with, and everything else, from design to engine rigging, is done in-house. Their 7.5m RIB, in my opinion, is a great example of an all-weather RIB. Pitched at the more experienced powerboater, it is also equally suitable for a newcomer. Their standard boat is built with grey tubes with black wear patches, jockey seats, a Suzuki DF200APX and the all-essential heavy-weather rise to the bow. This was the test boat for the day, and priced at £51,500 (inc. VAT) there are no extras, as you get what any self-respecting skipper needs in a 7.5m offshore powerboat. Unless you have some specific needs, it is not necessary to shell out another penny. Like most yards there is also a bespoke dimension to Island RIBs, including engines from every manufacturer (either petrol outboard or diesel inboard), as well as their own brand of shock-absorbing seat, which I can attest from my time in their photo boat is highly effective and the only extra I would consider justified. My first impression of the 7.5m was that of a pleasure/commercial mix. The tubes are heavy-duty grey Hypalon with large black wear patches (one of the best colour combinations for combatting fade) and protected with a heavy-duty D section rubbing strake. The seating is neatly sculptured insomuch as the front sections are tapered to assist standing and the rear winged backrests are a whopping 50mm thick, which I discovered work well for wedging yourself in when standing. Probably the most striking aspect of the design is the large moulded splash well, which houses three storage lockers while increasing structural rigidity in the stern. The neat camber to the top of the splash well is perfectly complemented by the tidy stainless bilge pump outlets feeding into it and the A-frame that sits astride. Behind the scenes the detailing is no less impressive, as opening the outer lockers reveals two watertight lockers designed for items like grab bags and tool kits, while the large inner locker gives access to the sub-deck bilge pump. As well as a concealed deck-level bilge pump beneath a small deck grate there are also two elephant trunks fed by tunnels running through the splash well housing. The batteries sit in watertight compartments under the forward seats, which connect to the rest of the boat via watertight conduits. Both the aft seats and the console also boast watertight storage. Retrospective maintenance has also not gone ignored as Island RIBs pre-drill an access hole in the splash well, which they then plug, enabling the outboard steering arm to be easily removed. In the same vein, a detachable section of the flooring under the seating can be removed, enabling access to the 44-gallon stainless steel fuel tank, as well as the tank sender enjoying its own smaller access panel. The windscreen, as Alex proudly pointed out, is made from shatterproof thick polycarbonate, sensibly surrounded by a stainless guard rail as you would not want to catch your face on this on a rough day. My first impression of driving the boat was that it is not overweight as she responded quickly to the throttle and turns with well-balanced precision. The 226kg Suzuki DF200APX is perfectly matched to the boat as this motor offers a good power-to-weight ratio that is perfect for a sprightly 7.5m RIB. Though Island RIBs will fit any engine you wish, the only other credible options would be Yamaha’s F200 at 221kg or Mercury’s Verado 200 at 231kg, as to fit anything bigger could potentially spoil the boat’s poise. I say this because this boat enjoys good natural fore and aft trim. She planes easily at low speed and only needs trimming up over 30 knots, and then only if you really want to crack on past the 40-knot barrier. I did find that excessive use of the trim button when running into the wind on flat water at full bore focuses you on just how much trim this boat really needs at wide-open throttle. If you overdo it, the bow can wag slightly, which is rectified by trimming the leg in until she settles down – alternatively take a look at the trim gauge and learn the boat’s needs as I subsequently did. In contrast, minutes later I was running trimmed in through the confused chop off Calshot at 43 knots, with the boat’s sharp forefoot cutting its way with relative indifference, which is clearly where this boat excels. Hitting anything truly lumpy is a breeze for its deep-vee hull, made all the softer by a sharp transom deadrise angle of 24.5 degrees, and I soon found myself looking for ferry wake to jump through. I will say that when driving in these conditions I like to stand in order to read the sea directly in front of the boat, for which I found the windscreen fractionally too tall as the guard rail sat in my line of sight. This is, of course, a personal thing and height dependent. Having such a sharp hull, this boat leans hard into the turns, especially as the tubes sit just above the water (at all speeds). Even so, there was no stern slip with either myself or Alex, who has clearly become accustomed to driving the boat to its limits. 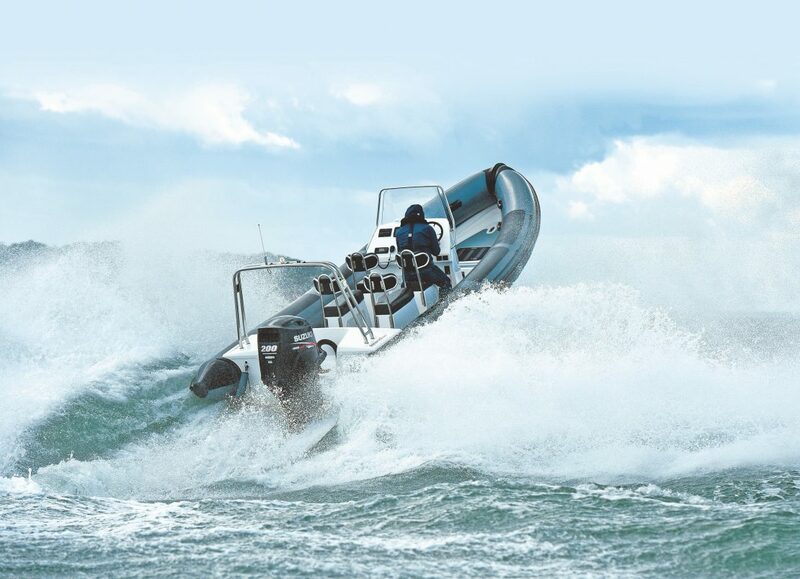 Island RIBs’ 7.5m RIB is an exciting boat to drive whose handling is as good as its looks. Beneath its superb gelcoat finish is a structural rigidity that can take the punishment that this sort of boat is likely to receive. The attention to detail is reassuring, as is the consideration given to potential future retrospective maintenance. Not many RIBs this size offer such a blend of practicality and performance at this price while including key items that many yards put on the extras list. The windscreen is too tall if you want to look over the top, and in a perfect world it needs a separate leg trim gauge that is easier to read at speed than the ‘all in’ Suzuki display.